I haven’t done a trip report for a while, and I’m sorry if it gets a little long-winded, but this trip was different and very special. Most of our trips are a mix of work and pleasure, but definitely a working vacation. Especially for a certain someone we all know. I won’t complain a bit though! I’m loving how things change and improve with each visit. This trip we shared our piece of paradise with our 7½ year old granddaughter, Linaya. We arrived in CC after a wonderful weekend in Colorado for Mark’s mom’s 80th birthday and family reunion. Mark had to head home for an appointment Monday morning, so he would join us in a couple of days. We were very exhausted girls, but so excited! She didn’t sleep on the plane, even after a 4 hour night and then the Denver airport at 6:30am. It was a good flight and we got through immigration which was slower than I’d seen it in many trips, and customs finally after that. Easyway was really busy too, so that took longer than usual. Got a great little standard, basic Nissan Tidda for $324 for 10 days. Still, we can’t wait to have our own vehicle there! As I drove down 307 with Linaya in the backseat playing DSi, my adrenaline kept me awake – and the chatter of my sweet granddaughter gave me energy. I was hoping she’d make it to CC, but she was finally falling asleep by Puerto Aventuras. Fifteen minutes later I pulled up to Leo’s Pizzeria and she awoke groggily but quickly with excitement. While we waited for our pizza to take home, she was thoroughly entertained by the geckos all over the walls. We walked over the Super Pool Express and got some milk for coffee and cereal in the morning and bevvies to go with the pizza. I tried to buy some Sol, but cases were locked. What? Oh, that’s right! When you’re away too long you forget the rule that you can’t buy any alcohol after 2pm on Sundays. When we pulled up to the house, Linaya said to me, “Oh Noni! It’s more beautiful than in the pictures!” That just melted my heart, and knowing that we have this place not only for us and our grown children, but for her too. 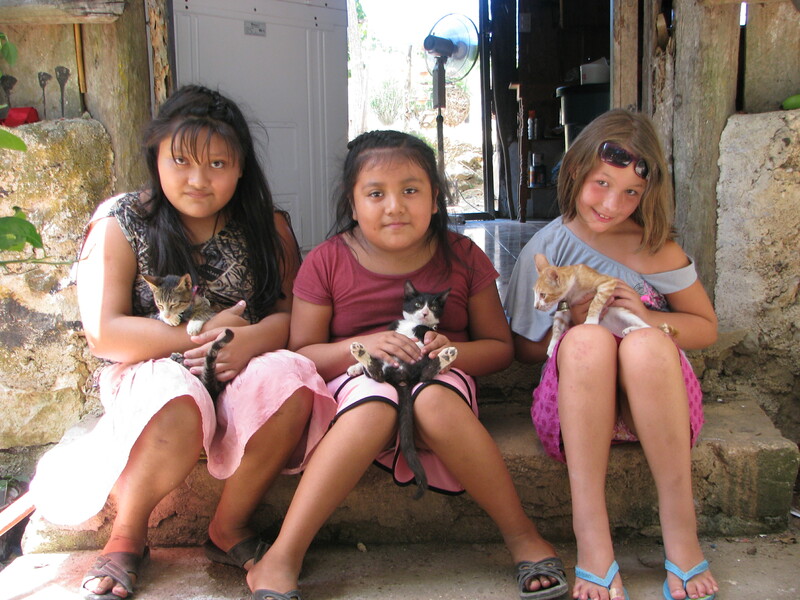 The house was sparkling clean and welcomed us – it just felt so good to be home in Mexico! We had our pizza sitting in the dining room under dim lights and it felt like we’d been here together before. Bedtime came and those puppy dog eyes talked me into her climbing into bed with me and watching Finding Nemo. Of course, I fell asleep…..into a sweet slumber. Not without turning on the a/c though, since it was really hot and humid. My pet peeve with a/c is it’s really difficult to regulate. I’m either too hot or too cold, like Goldilocks I’d prefer just right. It’s also noisy, but I tried to convince myself that it was like white noise. Still, I had sweet dreams. Monday we got unpacked and organized, taking it slow as we were all traveled out. In the afternoon we went to Xcacel and Linaya loved it! We played in the waves, jumping them and squealing and checking out the iguanas. Playing in the sand and watching sand crabs peek out from their holes. Monday evening I cooked a light dinner and did a bit of putzing around the house while Linaya entertained herself with her electronics – a Dsi. Sometimes those things drive me crazy, other times they do provide a good babysitter. It did afford me time to do some quiet thinking and planning which is adding to Mark’s honey-do list. The neighborhood was dead quiet and it seemed strange to me. It was my first time being there in August. There were a few people around but we all seemed to be busy and on our own schedules. I’d had the opportunity to meet the Bettisworths in Fairbanks recently, but we only crossed path once while there unfortunately. These 10 day trips go too fast! Mark arrived on Tuesday and we went up to Playa to meet him. There wasn’t any traffic and the driving was stress free being low season. With no stopping, we arrived at the ADO station in 30 minutes and timed it perfectly with his arrival. I always take the right at the light at the Holiday Inn and scoot to the bus station that way. Saves a bit of time, although driving all the way down Juarez is like eye candy, with all of the colorful sights! We stopped at Soriana’s for big grocery shopping before heading home. Mark unpacked and took some time to get reacquainted with the casa and the little things he wanted to accomplish on this trip. For once, the man is going to relax! Time for a quick dip in the Caribbean. It was after 5pm, so Xcacel was closed, but we managed to squeeze in a quick trip up the beach at the Bahia Principe. It may have been low season, for all of us northerners, but the Mexicans from other states were visiting as well as the locals taking in relaxing beach days. It was really hot after all! Our temp on the patio was reaching the low to mid 90’s, I think the beaches were around 87 – 90 with not much of a breeze at all. Anyway, the Bahia is a nice beach to take small children and young/early swimmers to. They have this area that is cordoned off with these strange looking sandbags, that protect you from the surf. Besides my favorite Akumal Bay, this is another option and it looked like you could even use the beach chairs, since it was low season. There are a lot of fish swimming around you in this giant pool and that was fun for Linaya to see. She was learning how to swim last summer and then the long winter helped her to forget everything. It was here at the Bahia ‘pool’ that she got her groove back and became comfortable with swimming again. She was so pleased with herself! It was so much fun to see her enjoy the beaches. The waves were a bit much but we had fun holding hands and jumping them. We went to the Tulum beach one day to visit Margo and I had the most wonderful massage! What I’d really like to do is have a massage at the beginning of the trip and one at the end. Margo has great technique and such a healing touch. We ate lunch together at Ziggy Beach. The food was great, but the waiter we had was not. He knocked over a smoothie on us and didn’t even bother to clean it up or bring us a wet cloth. I did ask him for another one and he had another waiter bring out. Strange! Se la vie! Perhaps the manager would like to know though. Margo ordered the crab burger, I had a crab/mango salad and Linaya ordered a Margherita pizza. The food was good though and we had a nice visit, despite a tired, grumpy (& slightly bored) little girl at this point. She had after all been traveling with her Mom for 1½ weeks to Florida prior to our trip to Colorado and now Mexico. Time for lots of patience and TLC! The next day we stayed home and kicked back waiting for the a/c repairmen to come. One of our units had frozen up. It ended up needing a full servicing, which we hadn’t done since 2008. Yikes! If you haven’t done this yet, you should. It was about $120 for the service and two guys spent 4 hours or so on it. You should also check the filters periodically for dust collection in the meantime. We carved out the wait time as well and had already planned a stay at home day. Linaya met the girls and the little boy next door (who is a cute, little pistol) and we had fun playing charades and trying to understand and learn each other’s language. Since we were unable to go to the beach, this was the perfect passage of time and experience for her on this day. We did lots of little things like replace weather stripping, hang a couple of hooks behind the door for the Swiffer mop and broom (what a great space saving spot!) and reorganize shelves in the kitchen. We thought a lot about future projects, too. We saw Edwin, the lobster guy, and we bought 6 lobster tails (for $180 pesos) from him and cooked them on our grill. We ate most of our meals at home on this trip, which really encouraged us to look at the kitchen space. It’s been a real plus adding the outdoor kitchen counter and BBQ as we can prepare much of our dinner outdoors and of course, that’s always the meal where you make the most mess. This is such great added space when we have company over. 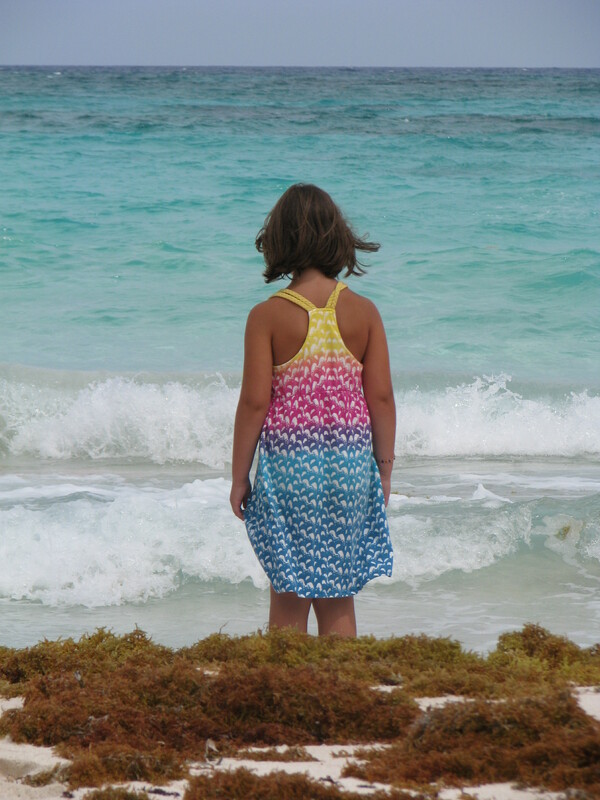 We spent a day up at Akumal, which turned out to be one of Linaya’s most favorites. She didn’t get the hang of snorkeling yet as she still has a fear of ‘not breathing’ underwater. I think she needs to do more swim lessons here in the NW and more trips to Mexico with her. 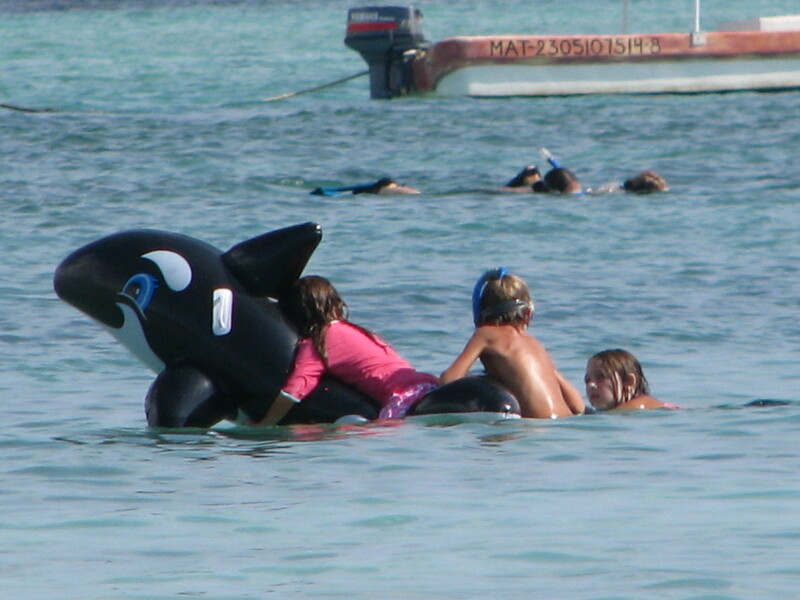 She was content playing in the water with a kickboard and a giant blow up Orca, which looked funny in Caribbean. She met some darling kids that were here age from California, one a girl named Katie who was just her age. The girls ran about from shop to shop with 50 pesos apiece and Linaya returned with a ukele. After 6 hours of rotisserie cooking myself in the sun and breaks under the umbrella, it was time to go home as I had returned to the casa with hot, sunburned skin. Coincidentally, they were staying in a house on Belize. The mum and grand mum were originally from England, and had these lovely accents. We decided to stay out of the sun the next day and drove out the Coba road for fun and to look for lighting. The fan over our dining room table went out, so rather than replace it, we decided to take the easy and cheap way out for now and replace it with a gourd light. We’d been eyeing them for a couple of years, but didn’t have a spot for one until now. There is a small hut on the right hand side of the road in Macario Gomez just next door to the older gentlemen who makes the beautiful carving reproductions. There’s a lovely Mayan couple who live here with their two daughters. Linaya enjoyed a leisurely visit with the little girls who lived there and their adorable kittens while we waited for our lamp to be finished. I’d asked about adding shells to a particular light I liked and they obliged my request right on the spot. So, if you’re looking for a gourd light, I would recommend this family business. We stopped along the way home at the Honey Store and bought some candy, some of their amazing aloe gel for sunburns and finally, they had HONEY! Did you know that they actually make the honey there? If you haven’t been here, you’ve got to check it out. The small hard sesame-honey candies are delicious! The gel is amazing and takes the heat right out of sunburn. I found this product several years ago and Keri Kunkle can attest to its healing qualities! There are lots of new places out on the Coba road, even during low season. I can imagine what it will be like come high season. It’s always a nice drive to take. We topped off our afternoon with ice cream in Tulum. If you haven’t been to El Michoacan across from Charlie’s, you are definitely missing out! 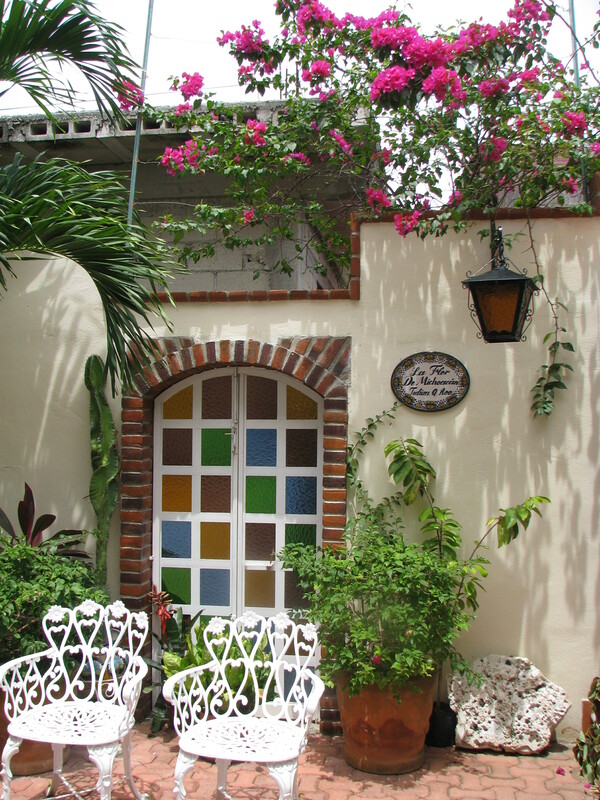 Not only do they have the prettiest and tastiest helados in town, but such a nice place to sit out front to people watch or in their backyard garden, which is beautiful and shaded. We had arranged to do a turtle walk at Xcacel for a Monday evening. Linaya was eager to see turtles nesting and wished she didn’t have to wait. 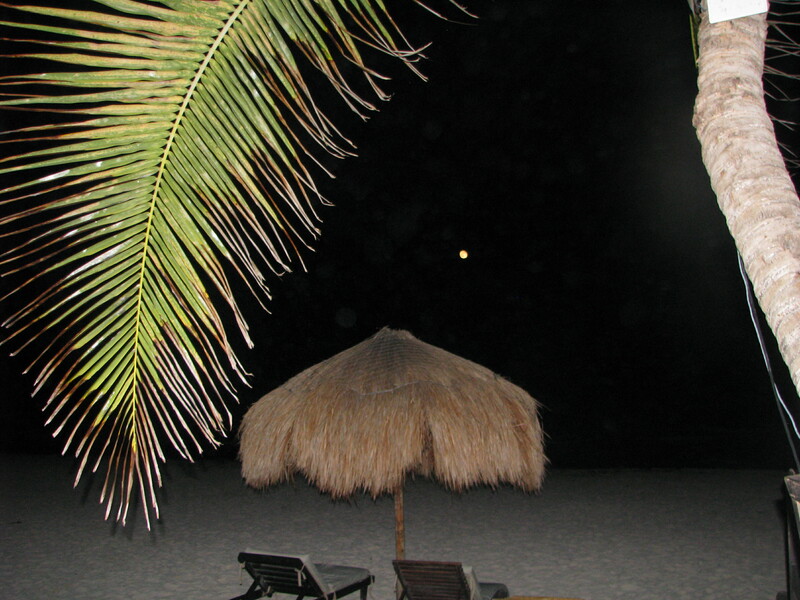 Besides she was privy to conversations we’d had with various people, Margo included, that all you really have to do is walk along the beach at night. 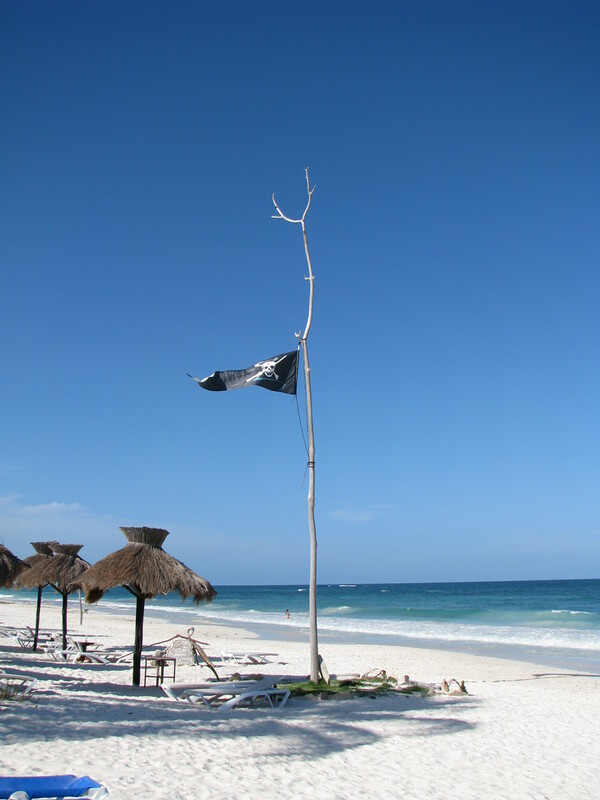 We heard reports that this was a fabulous season with many turtles and nests doing their thing along the Riviera Maya. Plus she was pretty adamant about watching this happen under the full moon as it did in one of her story books. We met up with our new friends from California at the Lol Ha and started walking down the beach. There were so many nests everywhere this year that you had to constantly change your path as you walked through the sand. We came upon a beach patrol who had a bucket of baby turtles and that was exciting for the kids. Eventually, we hooked up with the folks from CEA and they also were releasing some babies into the sea. As we turned to walk back we saw a giant sea turtle digging her nest with a small crowd around her. This was happening right on South Akumal Bay and up against some stairs that led to a villa. We watched patiently for a while and she finally got frustrated and left, crawling about 15 feet to the south where she started to dig again. We got the attention of the CEA team and they asked how long she’d been at it. Although it was a Saturday night and not a scheduled ‘tour night’ they shared great information with us. The female turtle was now in that ‘trance’ mode and Linaya actually got down in the sand on her hands and knees, looked into her face and watched her as she laid egg after egg into the deep hole she’d dug. We lucked out and had our own turtle walk and best of all, it was free! Perfect, as most of you know it’s been a sparse few years for the economy and we’ve been directly affected. By the way, Xcacel is now charging $30 US per person for the turtle walk. I am certain that the money goes to a good cause though. Children 8 and under are free. Monday came and we ended up running a few errands in Playa in the morning and going to Puerto Aventuras for lunch at Gringo’s Catina formerly known as Gringo Dave’s. We’d not been before and were curious to check it out and of course, see the dolphins. Puerto Aventuras is a gated community with a marina, Dolphin Discovery, golf course – it seems like its own little city and sort of reminded me of Lido Island, Newport Beach, CA back in the day with a little bit of funky vibe. There was a strange scum that floated on the surface of the water, which Linaya told us that she learned it was the dolphin’s skin. A dolphin sheds an entire layer of skin every two hours.I didn’t remember seeing this when we went to Xel Ha, but I imagine there are seasons where they shed more just like a dog would. Quite naturally Linaya wasn’t interested in food, but walked around looking at the dolphins while we sat under an umbrella having some ceviche and cerveza while watching from our table. She had her camera with her and our budding photographer was enjoying herself immensely. It wasn’t long before she asked if she could swim with dolphins, and how could I say no? We asked about the next swim time and we were going to miss it if we didn’t hurry! Linaya made it in the nick of time and soon walked into the water with us watching from the sidelines. What a brave little girl! 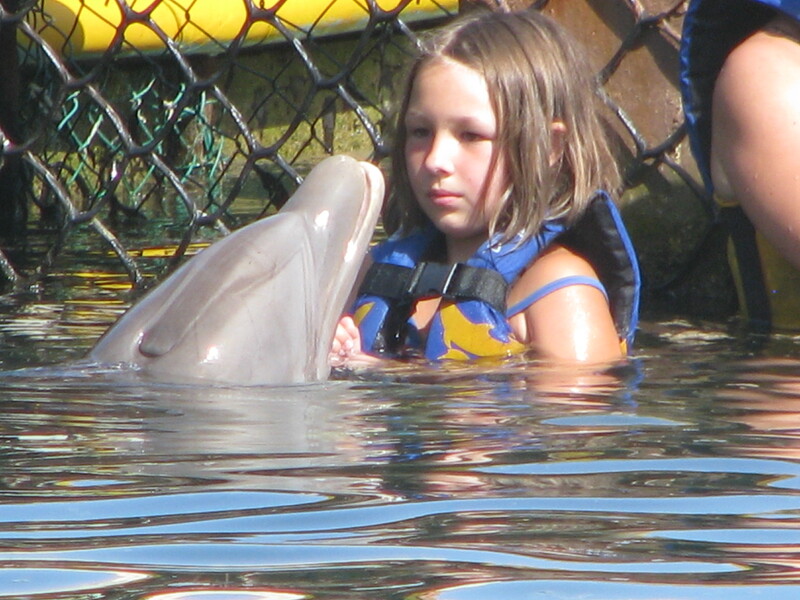 In she went……dolphin heaven! This was the other ‘highlight’ of the trip for her and for us to watch the smile on her face! We walked around the marina afterwards and came across Captain Rick’s Fishing and thought about how much fun it would be to go out fishing next time we’re down. We’d only been out on a small panga type boat of Akumal before and I believe at about the same price or even cheaper with a group of people. Check out this boat and it’s name. Kind of apropros under the circumstances. We’ll have many opportunities to go out fishing in the future. After the past couple of days and the fact that Linaya was able to meet her two vacation goals (the turtles and the dolphins), we decided to pass on the walk at Xcacel. Considering the economy and our lack of non-discretionary funds, it worked in our favor to see the turtles other places we went. Later that evening, we tried El Mariachi in Tulum one evening. I wish I would have stopped in at an internet café for reviews first. It deceives you with its colorful and attractive façade and its busy look. The service was extremely slow, the food expensive and bland. We ordered the surf & turf plate to share and there was more garnish on the plate than food. As we sat and waited, we saw other unhappy faces around us. Not a good sign and in retrospect, we should have gotten up and left. Almost two hours and $60 later, which is expensive for two meals in Mexico, we went home and drowned our sorrows in ice cream. Monday evening Mark and I went on a date. Linaya went over to hang out and watch movies with Michelle. We went to La Zebra in Tulum for an evening under the full moon and a light dinner and some mojitos. I love theirs as they make them with pure sugar cane. It was low season and we knew it wasn’t likely we’d be finding any live music on a Monday night. What we didn’t realize is that we’d be thoroughly entertained by a turtle coming up to lay eggs. There were only about 6 patrons that evening, including us. We were talking with the waiter about the turtle season and what a good one it seemed to be. We had seen many nests on all of the beaches we’d visited. All of a sudden, I was the first to notice her crawling up towards the restaurant and alerted the waiter as he’d just started to leave and go for our drinks. Eventually as she neared the restaurant, the waiter asked if we minded them turning off the lights and of course, we replied “please do!” We continued to watch as she’d set in for the dig. She had yet to settle into the ‘trance’, when some yahoos were walking towards the beach with a flashlight. They continued onto the shoreline where they stayed a few minutes and turned around to walk back through the jungle area between La Zebra and some cabanas. They spotted the turtle with their light and continued to shine it in her direction – into her eyes. We all yelled at the passersby but by this time the turtle had stopped digging her nest and started to quickly retreat to the sea! Then we couldn’t believe what we were seeing. The guy started chasing the turtle. By this time we are yelling at him again. Finally one of the patrons we’d visited with earlier and who was closest, bound down the stairs of the deck and across the sand to stop him and explain to him the problem he was causing. Sheesh! I was so surprised that he wouldn’t know that this was wrong. Hadn’t he read anything? Or heard anything? Obviously oblivious! We were sad to see her frightened, I wonder if she came back out later that night. I am hoping that the restaurants, hotels and property owners in the area, including all of us, better educate our family, friends and guests about the protection of the turtles and this ecosystem that we’re all a part of. 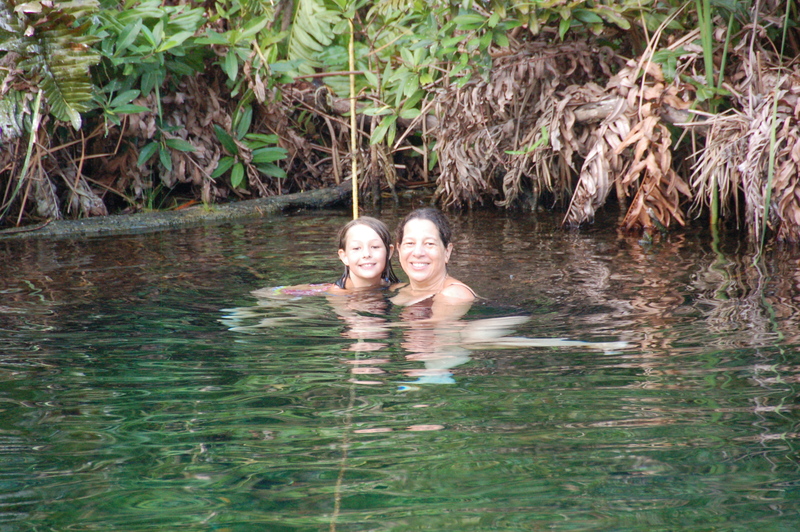 It was so wonderful to spend some time at the big cenote, Xhunaan Ha, which is out the jungle road behind Chan Chemuyil. It was a very hot, humid Sunday afternoon. There were several of the local families there having a great time, but it didn’t feel crowded. After much contemplation, Linaya decided it was time to get rid of her fear of deep water. There’s a rope that goes from one side to the other and with Papa easy talking her across, she made it! We brought a couple of kickboards and bunch of noodles and ended up sharing them with everyone. How I wish I knew the language! I’m so impressed with those of you who speak Spanish even fairly. I get by, but I would love to find more time to learn and use both Spanish and Maya. The only real work we did this time was some pruning of our bougainvillea and mandevilla. We cleaned out the beds on our patio really well and added some pretty white rock that we’d gotten up in Playa at the place that Joe and Renee first took us too, Cupulas y Bovedas. They have a wonderful selection of rocks and amazing selection of tile. Their prices are pretty good, too. I seem to make a trip up here every visit and they seem to know my face now. That’s about it…..time to start planning for the next trip. I’ve already got a suitcase started with a few new things for the casa. I know that my tan is fading faster than my memories. As fall sets in, the planning and the memories will keep us both warm!